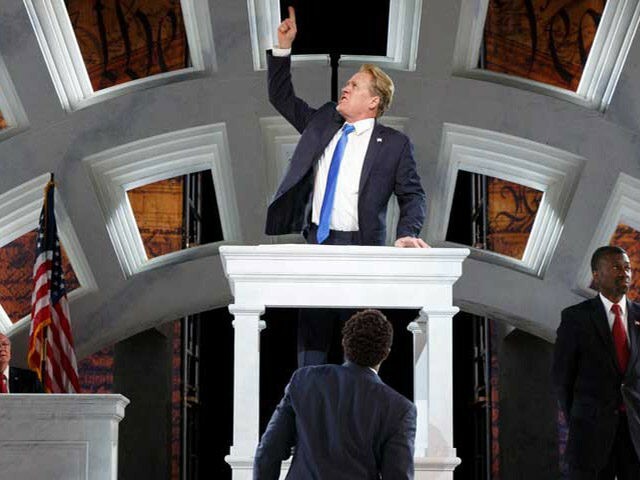 NEW YORK (AP) — The Public Theater is refusing to back down after backlash over its production of “Julius Caesar” that portrays a Donald Trump-like dictator in a business suit with a long tie who gets knifed to death onstage. Other defenders included Scott M. Stringer, the New York City comptroller, who wrote letters to the heads of Delta and Bank of America, arguing that dropping their support “sends the wrong message.” He writes: “Art matters. The First Amendment matters. Expression matters.” He enclosed copies of the play with the letters. “I hope you enjoy it — it is a classic, in any age,” he wrote. Though the Public’s version of William Shakespeare’s classic play is unchanged from its 400-year-old original, the production portrays Caesar with a gold bathtub and a pouty Slavic wife. Trump’s name is never mentioned, but backlash was swift. “Julius Caesar” ends its run Sunday. The comedy “A Midsummer Night’s Dream” begins in the park on July 11. The National Endowment for the Arts, which Trump, a Republican, once proposed eliminating, said that while the Public’s Shakespeare programing has received its grants in the past none was awarded for “Julius Caesar” or for funds supporting the New York State Council on the Arts’ grant for the Public. Theater lovers were quick to point out that a national tour of “Julius Caesar” in 2012 by The Acting Company featured a Caesar played by a black actor in a modern business suit who had a resemblance to then-President Barack Obama, a Democrat. Sponsors of the Guthrie Theater, including Delta, apparently had no objections when that show landed in Minneapolis. It’s had Trump in its sights before. It’s the institution that birthed the megahit “Hamilton,” whose cast members last year implored Vice President-elect Mike Pence to support diversity, and where Meryl Streep donned self-tanner and a fat suit last summer to impersonate Trump at a gala fundraiser. Laurence Maslon, an administrator and arts professor at New York University’s Tisch School of the Arts, said it was disingenuous for large corporations that have backed the Public for years and enjoyed co-opting its downtown cool vibe to sound alarmed now. The Public produced “Embedded,” Tim Robbins’ heavy-handed 2003 riff on the events leading to the war in Iraq that had actors portraying hawkish presidential advisers wearing masks with grotesque facial expressions. In 2006, Eustis dedicated the summer season in Central Park to three works that focused on foreign affairs — “Stuff Happens,” in which David Hare looked at the debates in Washington in the lead-up to the Iraq war, a militaristic production of “Macbeth” set in the early 20th century and a “Mother Courage” with a new translation by Tony Kushner that had references to tax exemptions for the rich. “I can imagine any sense that this political regime is imposing a kind of censorship and the free market can help correct it will probably be good for the Public,” he said. The recent off-Broadway play “Building the Wall,” by playwright Robert Schenkkan, imagined the country under Trump’s campaign promise to detain immigrants living in the country illegally. And filmmaker and activist Michael Moore is bringing a one-man show taking on Trump to Broadway this summer.